Many may recognize this quote from George Orwell’s classic dystopian science fiction novel “1984”. I somehow managed to complete both secondary and higher education without ever reading it. Recently, I was challenged by a friend who thought the novel should be required reading and so added it to my summer reading list. George Orwell published “1984” in 1949 as a powerful political satire warning of the dangers of a totalitarian society. To refresh your memory or for those, like me, who have never read it, the protagonist of the novel is Winston Smith, a low ranking member of the ruling Party. Winston works as an editor in the ministry of truth where he is responsible for historical revisionism by rewriting newspaper articles so that the historical record always matches the Party’s agenda. 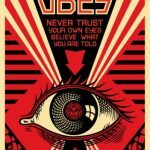 The Party along with its omniscient leader, known as Big Brother, controls its citizens through the use of omnipresent government surveillance, public manipulation and mind control. [Spoiler Alert] Ultimately, Winston is brought before the Ministry of re-education. He is tortured until he willingly states that the interrogator is holding up five fingers when he is really only holding up four. Inevitably, Big Brother wants everyone to capitulate to whatever the Party purports as truth at that moment, regardless of reality. With democracy eventually winning the Cold War and the subsequent fall of the Soviet Union, the world that Orwell envisioned in “1984” never completely materialized. However, one cannot read this novel without noticing many disturbing elements of “1984” in our society today. Winston’s “War is Peace” and “Freedom is Slavery” has become our “A man is a woman or a woman is a man,” denying verifiable DNA. This comes at the same time that our culture is ever more obsessed with better understanding themselves through an intense search of family trees and ancestral DNA while at the same time denying that the same DNA determines their sexual identity. To the other extreme, we have the man-made Global warming alarmists who completely shut down debate of their consensus driven interpretation of selective data even though a statistically sound predictive model has yet to be derived. Orwell was pointing out the extent to which societies will go to embrace false ideologies. Today, we need to fervently insist on the truth to combat the willingness to deny reality in order to live in a world of comfort and delusion. If people will not even believe observable or scientific verifiable facts how can we ever expect them to accept the transcendent truths of God? I would like to see the Church work hard to maintain (reclaim, perhaps?) her preeminence in leading intellectual/scientific pursuits, in addition to faith and morals. There is nothing to fear from science (as it relates to faith) unless science is allowed to be subverted for political purposes.